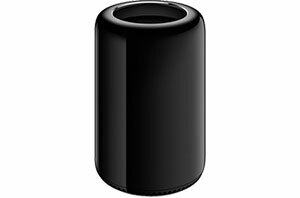 Unveiled October 22, 2013 as the "Most Radical Mac Ever," Apple architected the Mac Pro (Late 2013) around a unified thermal core that allows the system to efficiently share thermal capacity across all the processors. The Mac Pro features 4-core, 6-core, 8-core or 12-core Intel Xeon processors running at Turbo Boost speeds up to 3.9 GHz that deliver double the floating point performance of the previous generation Mac Pro. Two workstation-class AMD FirePro GPUs with up to 12GB of video memory provide up to seven teraflops of compute power and up to eight times the graphics performance of the previous generation Mac Pro. The Mac Pro also features PCIe-based flash storage that delivers sequential read speeds up to 1.2GBps and is up to 10 times faster than conventional desktop hard drives. ECC DDR3 running at 1866 MHz, with a four-channel memory controller, gives the new Mac Pro up to 60GBps of memory bandwidth, twice that of the previous generation Mac Pro. The spectacular power and bandwidth of Mac Pro means you can seamlessly edit full-resolution 4K video streams and play them in real time.